A common security metric is a count of the number of vulnerabilities found. Many organizations measure it and many say that it is a common mistake as a measure of security effectiveness. Sometimes -- this is a necessary metric. But most times it is indeed a mistake. Why? Because there is no business context. We will show how not to use this metric. What would a time series graph of the number of vulnerabilities found demonstrate? An ability to mine for vulnerabilities? What happens when it goes up? Celebrate that you can find issues? Or when it goes down? Does it mean you are losing the ability to find vulnerabilities? Or that developers are improving? In most situations, this metric is a mistake. But there is one situation when this might work. When you are in the very beginning of a security turnaround. A product that has had security neglect either from the very beginning or for years. No active security testing and customers were testing the product for the software vendor by reporting security issues. You were hired to not only perform a turnaround, but also start-up a security program. This hits two categories of "STARS"
There are limited situations when vulnerability counts can be used as a metric. You can't use it stand-alone and its use is generally limited to turnaround situations. In a turnaround situation, you need to demonstrate, as part of a larger story, that the security program is working. What story does this tell? Identifies systemic and persistent vulnerabilities for remediation investment. In this case, the immediate focus area should be in resolving a systemic and persistent problem around "cwe-79," also known as Cross-site Scripting. It should be obvious that all vulnerabilities entered into a bug tracking system should be tagged with a standard Common Weakness Enumeration (CWE) identifier. Historical view of the types of vulnerabilities that have appeared in the system under test. No particular executive action to be taken here, other than informational. Demonstrates the system is clearly not free from vulnerabilities -- it would be good to compare this to the overall population of software defects. At best, this would pull heads from the sand that the system does have issues requiring attention. Be sure to convert the CWE identifiers to a common name that the Executive may understand. Please add comments to this page for corresponding terms useful for Executives. See the Wall Street Journal's Number of the Week column for examples on how to apply this concept to other security metrics. Identifies systemic and persistent vulnerabilities for remediation investment. A time element as seen in Metric 1, is not always needed. This shows the bulk of problems in the application is from "script injection." It's likely that spot-fixing the problems will not solve the problem and that a larger framework solution is required to stop this class of vulnerabilities. After all, 62% of all vulnerabilties found are related to this vulnerability class. Our customers tested our products for us. To an Executive, it clearly shows that in 2010, all reported security issues were from customers. The company's security testing was extremely inadequate. A turnaround is in effect. That's the point of this entire article. To demonstrate you are righting the ship. Security defects leaking to customers are disappearing and the other detection methods you have brought in are beginning to show promise in 2011 and have been a break-through in 2012 and 2013. Defect Removal Efficiency measures your ability to detect a defect before it gets to your customers. What's a good number? Depends on your industry and the criticality of your product. A common number to beat is between 85% and 95% for medium risk systems. Obviously, if this is medical software or military grade software, you probably want to be near 100%. Depending on your goal percentage (85-95% is a common goal -- see Capers Jones for benchmarks by industry), similar to Metric 3, this shows how far off your organization is from your peers. 0% says a great deal -- all vulnerabilities were detected by customers - this is terrible for your organization's reputation. This also easily shows how your security program has turned things around. Evidence that a security turnaround is in effect. Watkins, Michael D. "January 2009." Picking the Right Transition Strategy. Harvard Business Review, Jan. 2009. Web. 07 Sept. 2013. So you've made your changes and your are ready to commit them to not only your local branch, but also Github. Grouping files together make your Github pull requests much easier to handle -- especially if you are looking to resolve a specific issue or make a specific enhancement. git add . is the equivalent of a recursive add for everything from the current directory downwards [More Information]. This will show everything that has been marked as a change. A good sanity check that the pending changelist contains everything you expect. The "-s" means short output. Step 2: Commit the changelist to your local branch. Step 3: Push the committed changes from your current active local branch to the upstream remote branch. Whether you are leading a new security program or leading an existing one that left many with sour memories, or worse both, Management may have a perception that you are a heroine here to save the day. Similarly, as a security professional, we oftentimes think a product we purchase may do just that (more about this later). Nevertheless, it is of immeasurable importance to manage expectations as early as possible, best when you broadcast the chart you course (or your Security Roadmap). Suppose your company does not give anyone the sense that you are secure or safe. Just because you have been appointed doesn't mean the change will happen overnight, in a month, a year, or even two years. Furthermore, you need to reinforce to Management that very expectation. Changing brand perception is one of the most difficult things any company can do. Whether it is to change a perception that this Company can perform services or products very different from what is done today. Think about the American auto industry. It was over 10 years ago that they delivered some of the worst quality products to date. However now, Ford is one of the top rated manufacturers of quality yet many Americans, previously trusting then horridly burned (some literally), are hesitant to return to Ford. Changing a brand perception takes years. Microsoft has been working on it since Windows 95 and now in Windows 2003, 2008, (let's not think about Vista), and Windows 7, they have begun to show they can help set the pace in software security (how many others have modeled their vulnerability management program using Microsoft as an example to improve upon). If changing brand perception takes years, losing it takes only days or months (think about BP). Reputation is easy to destroy, hard to build and maintain. Oftentimes, customers don't demand security or explicitly ask for it. They expect it. It's something they don't think about or necessarily ask for unless they are already quite aware of the need for and importance of security. Thus, it is a frivolous point to say that we don't need security because not a lot of people ask for it. Or we don't need to fix this because not a lot of people reported it. Security vulnerabilities are defects but defects are not security vulnerabilities. These are one of many expectations that must be managed and concepts instilled. This was a well-run and well-attended event considering it was free for ISC2 members. Surprisingly, ISC2 provided refreshments and bagged lunch (or perhaps it comes free when you rent a space in the Ronald Reagan Center in DC). One of the last two session leads had a personal issue and was not able to make it. I'm not sure which since I had to leave after session 4. As I had mentioned in a previous post, I was interested in hearing this session. While the seminar description alluded to how it might discuss security in contract language, it was only discussed in about 30 seconds. Essentially, it is heavily forthcoming from customers at least a line in contracts or RFPs that ask how a software vendor handles the Top 25 vulnerabilities. The session lead, Robert Martin, described his experience in working with the major security software vendors in getting their input for the CWE and getting them to use CWE content in their products (static and dynamic security scanners). In doing this, he discovered that application security scanners don't have much in common. While they all scan for cross-site scripting and SQL Injection well, they do not have much overlap. This is consistent with what I described in an earlier post where each aspect of security testing is only able to detect a portion of the total population of vulnerabilities. We all laughed that perhaps they shouldn't call each other competitors since that would imply they have almost the same products. I would like to see some test report on what each major software vendor was able to find - I suppose that would be much like a Gartner Magic Quadrant report but I would like to see the test results since what Gartner says is a leader doesn't mean it will work for you since your applications may need focus on other vulnerabilities. Nevertheless, it would be worthwhile to use multiple tools. 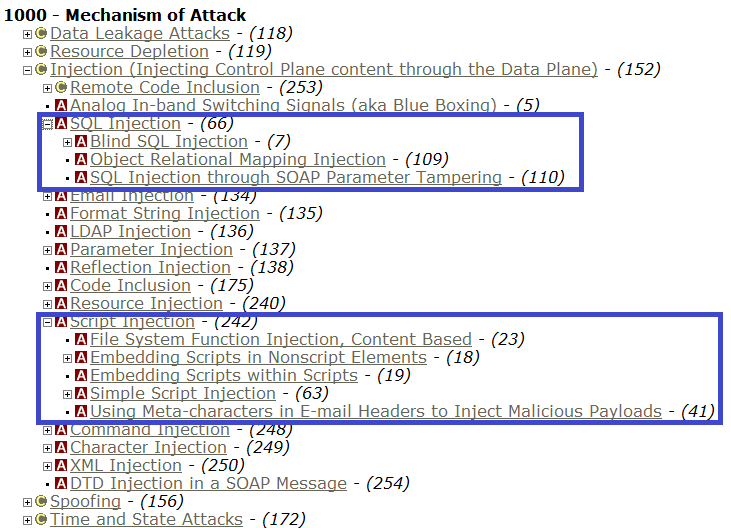 XSS beats our SQL injection as top vulnerability of this era in web application security because there are 17 ways to attack it while SQL injection has 5 different ways (as of this post). Furthermore, XSS is more difficult to fix since there are so many different entry points and a larger attack surface.